Because the men and women of the army are sacrificing and serving, the rest of us can enjoy the peace and liberty soldiers have always secured and protected. 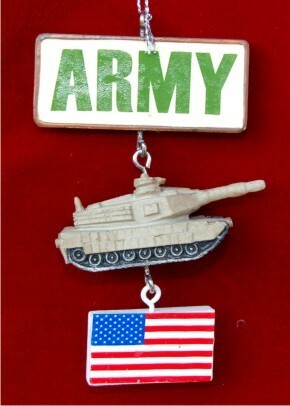 The US Army and flag personalized Christmas ornament is a wonderful depiction of American strength. Each of these handsome military ornaments personalized from Russell Rhodes includes a cord for displaying it virtually anywhere. These US Army ornaments are ideal for showing support to those serving, and they make great gifts for active duty, reserve, national guard and veterans too. Stand with the men and women of the military with the US Army Christmas ornament that arrives in our class velvet drawstring pouch. For retiring uncle Dec 15, 2014 Dave I.